Impeccable design. Remarkable quality. Welcome home to Silver Spring Station Apartment Homes. With a range of floor plans available, it’s never been easier to find your dream home. 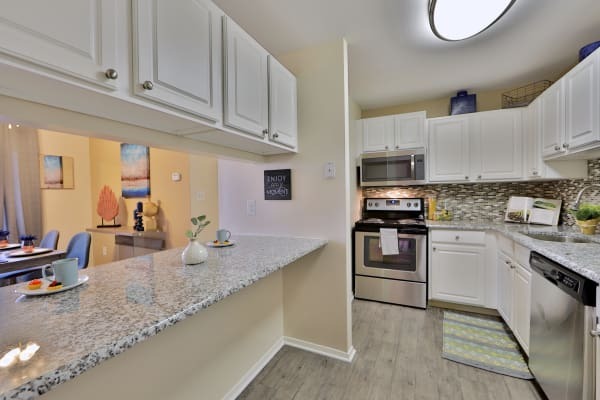 Choose your favorite layout from our one, two, and three bedroom Baltimore, MD, apartments. With exceptional floor plans ranging from 798 – 1,200 sq. ft., your new apartment has the space you need for the life you want. To ensure your space will exceed your expectations, each apartment undergoes a 101-point inspection, backed by the professional management at Morgan Properties. We know that your home is your refuge at Silver Spring Station Apartment Homes. That’s why we’ve designed our stylish living spaces around your absolute comfort. Enjoy your spacious master bedroom with plenty of space for your king-sized bed. Show off your culinary skills in your updated kitchen, complete with gorgeous granite countertops and modern stainless-steel sinks. Schedule a tour of our Baltimore, Maryland, apartments with the professional team at Maryland today.